Many Texans Bereaved Over 'Dead' Voter Purge An attempt to purge tens of thousands of "dead" voters from its election rolls has spawned a backlash across the state, involving the registrar in the state's biggest county, the secretary of state and the Texas Democratic Party. 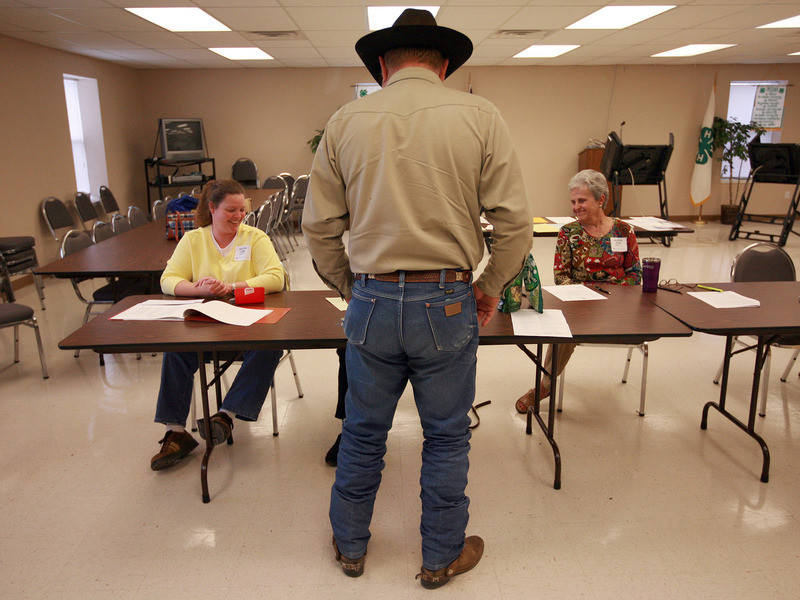 Volunteers check in a voter in Palo Pinto, Texas, in November 2008. The state is using a list from the Social Security Administration to purge dead voters from its election rolls. Quite a few Texas voters are seeing dead people in the mirror these days when they go to brush their teeth in the morning. In Houston, high school nurse Terry Collins got a letter informing her that after 34 years of voting she was off the Harris County rolls. Sorry. "Friday of last week, I got a letter saying that my voting registration would be revoked because I'm deceased, I'm dead. I was like, 'Oh, no I'm not!' " Collins says. In order to stay on the rolls, the 52-year-old nurse had to call and inform the registrar of her status among the living. She tried, but it didn't go so well. "When I tried to call I was on hold for an hour, never got anyone," she says. "I called three days in a row and was on hold for an hour or more." Collins, who is black, says she noticed that in Houston, quite a few of those who got the letters seemed to be older and black. Do Voter ID Laws Prevent Fraud, Or Dampen Turnout? "There's one lady here. She's 52. She's African-American. Her dad is 80. They both got a letter saying they're dead," she says. Like all states, Texas regularly purges its rolls of voters who've died. Normally, this is a low-key process where the state passes along to the counties a small list of dead voters as they become available. But this massive mailing two months before the election is new. Rich Parsons, a spokesman for the Texas secretary of state, says the state is not targeting anyone but dead voters. "We're required by law to maintain a clean and accurate voter registration list, and we're attempting to comply with that mandate," he says. "I will tell you that it was our hope to have done this after the March primary but, unfortunately, redistricting litigation delayed the primary and the associated deadlines." Parsons says none of this is a problem; voters who've been wrongly purged from the rolls can simply show up and vote anyway. Democrats are skeptical that a person whose name is not on the roll will be allowed to vote. They say Hispanics especially are likely to be suspected as illegal immigrants trying to vote illegally. "The secretary of state has notified 80,000 individuals that it says are deceased," Texas Democratic Party Chairman Gilberto Hinojosa says. "And so when a Hispanic is being told that he's dead, most sociologists will tell you a Hispanic is probably more prone to just accept it and walk away, say, 'Somebody made a mistake. I don't have time to bother with this.' "
Texas got the names off the Social Security Administration's death list. Social Security warned Texas that the list shouldn't be relied on, but to no avail. The state Legislature and Texas Gov. Rick Perry passed legislation last session mandating the change. In Houston, after Harris County Tax Assessor-Collector Don Sumners got hundreds of calls from elderly voters who'd gotten the death notice, he looked at the Social Security list that was being used. "And then a quick check of some of the information on that database led us to believe that there was a big probability that even a majority of the names on the list were people that were still alive," he says. "Well I can't give you the exact words," Sumner says. "But basically that they were escalating this fight and they were picking on the wrong guy because I was not going to back down and they were going to lose the battle." That's where it stands now. Houston is not going to purge its voter rolls until after the election. But the rest of the state will do so. Democrats are thinking about suing Texas.